Hi everyone! Once a month the blog group I belong to has a challenge and this month's challenge was a tricky one for me. 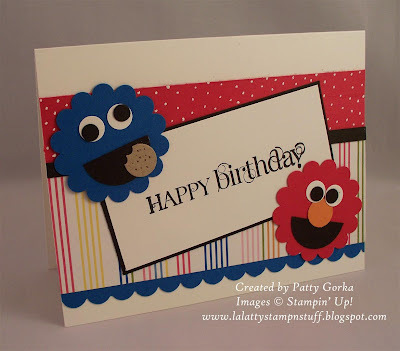 The challenge was "Animal Birthdays" and we were to make cards using an animal character and four shapes of any sort somewhere on the card plus colors red and blue. My teenage daughter actually came up with this idea of making Cookie Monster and Elmo so they are my animal characters. The shapes I used can be found within the punch art (circles, half circles, scallop circles, as well as my rectangle sentiment panel). What a great idea! Your daughter is off to a great creative journey! Beautiful card! So cute. I thought about making a punched shape, but wasn't creative enough for it. I'm ONE card behind you in the 100 day challenge. That gives me incentive to keep motoring along with you! Patty--what a great card and I love the punch art This is so cute and will make a cute card for a kid! Great way to create cookie monster and elmo - love it! OH Patty... I love Elmo and cookie monster!!!. I found this punch characters long time ago on SCS and it was too late to make it for my sons... I think they are adorable... maybe I can use them for a scrapbook page, I'm still so behind with their albums that in some pages will work. Awesome card!!! Love your Elmo and Cookie Monster made with the punches. Any kid would love to receive your card.